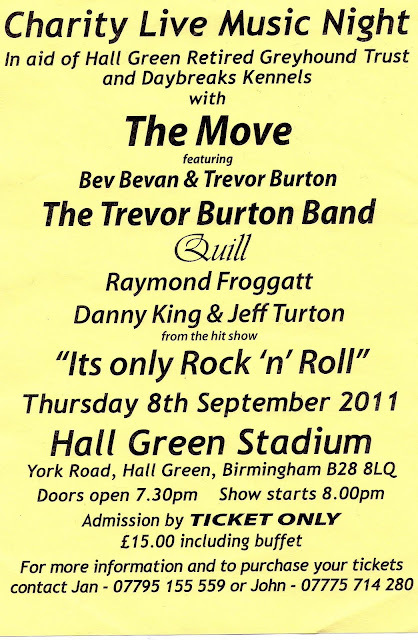 ELO Beatles Forever [ELOBF] will be publishing a review of the aforementioned gig in the very near future and in the meantime, we are pleased to promote the above live music event at Hall Green Stadium in Birmingham on Thursday 8th September in aid of a charity very close to Trevor's heart and will feature The Trevor Burton Band [naturally! 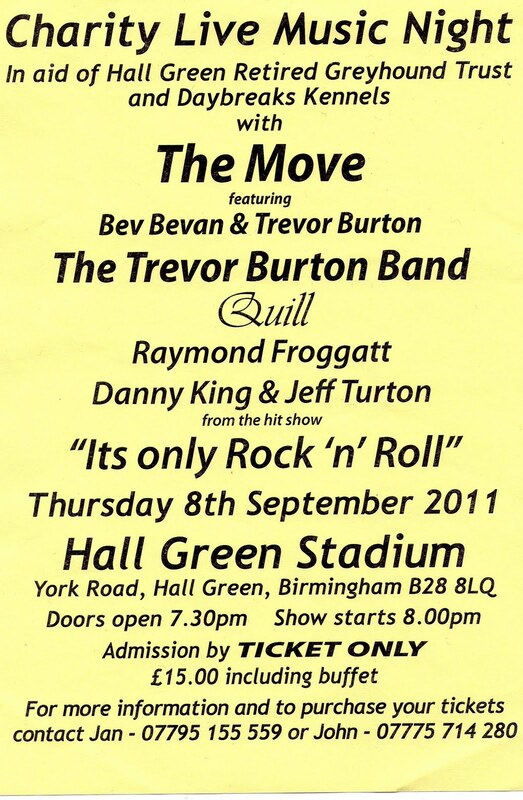 ], Geoff Turton, Danny King, Raymond Froggatt, Quill and [naturally] The Move who, of course, feature Trevor and Bev Bevan. Contact Jan on  155559 or John on  714280 and invest in a ticket or three! Yours Truly KJS is also very pleased to confirm that Trevor has agreed to an interview with me for ELOBF ... something to really look forward to [hopefully]! ELO Beatles Forever [ELOBF] recommends The 1st Annual Trevor Burton Charity Show to those enlightened folks who enjoy the music of ELO, Jeff Lynne, Roy Wood, The Move, The Idle Race, 'Brum Beat', The Beatles and related artistes.